Tucked away in a tiny little retail building on Royal Oak near Rumble Street in Burnaby, a modest Eastern European restaurant has taken over the location formerly occupied by Long J L Chinese Cuisine. It’s quite easy to miss this place as it’s somewhat hidden by the Chevron gas station next door. Given the relatively dark interior, I took advantage of the warm April weather that we had and sat on their patio in front of the restaurant. It was actually more pleasant than you’d expect given the proximity to the gas station (didn’t smell any gasoline fumes and it was relatively quiet during my visit) and I got to enjoy the view of the cherry blossoms in bloom. 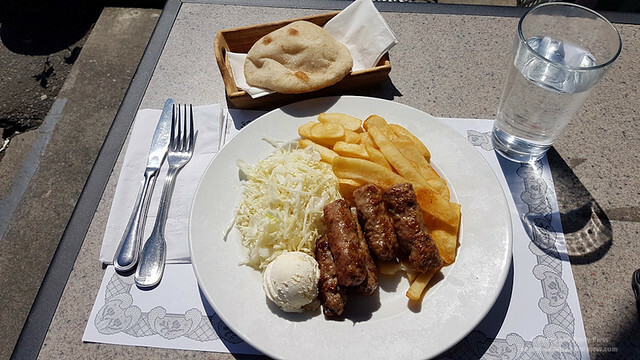 For my lunch, I picked the Chevapi ($11.95) which comes with 5 pieces of traditional minced meat kebabs served with fries, coleslaw, and homemade bread. While the chevapi kind of resemble breakfast sausages, they don’t really taste like it. 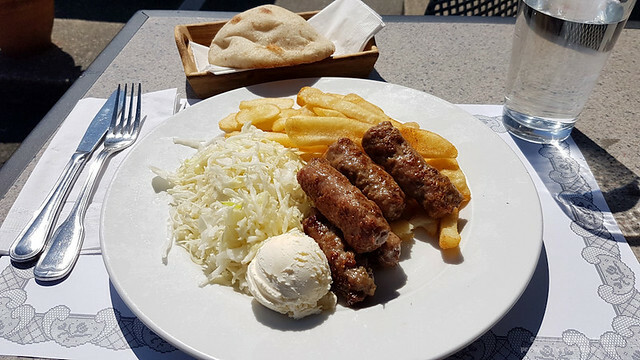 They reminded me of the similar cevapcici that I had years ago at Balkan House on Edmonds. The sausages were good and the coleslaw had a nice crunch to it. But surprising, the thing that really stood out for me was the homemade bread that came along with the meal. It was puffed up in the shape of a dome and had a soft interior that provided the perfect amount of chewiness while the exterior was a bit crusty. 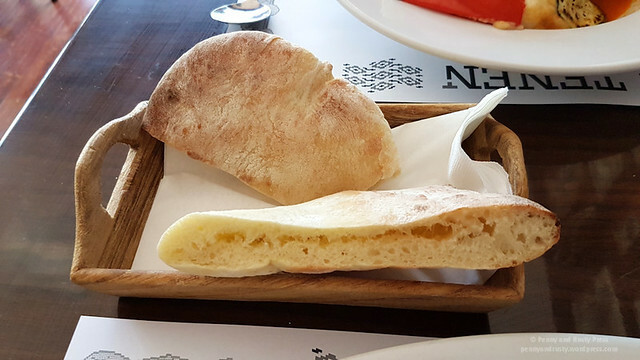 I’m assuming it was a type of lepinja bread which is common in Eastern Europe. I returned for a revisit in mid-July with my sweetie to try some of their other dishes. 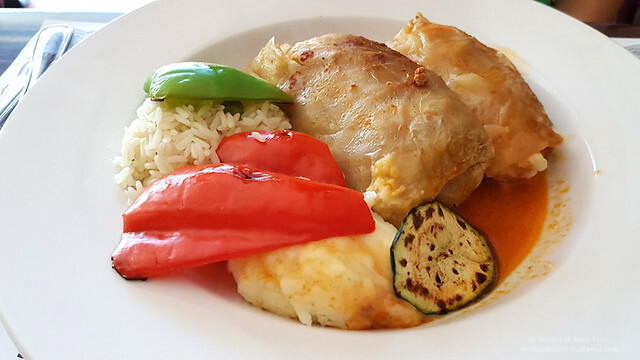 The Cabbage Rolls ($16.95) are filled with seasoned ground pork, beef, and rice inside the sauerkraut leaves and accompanied by a helping of mashed potatoes and veggies. This, as most of the items we’ve had here, is a very hearty meal. Again, we had more of that great homemade bread that they serve here. We also ordered the Karadjordjeva Schnitzel ($18.95) which is a Serbian breaded cutlet dish named after the Serbian Prince Karađorđe. 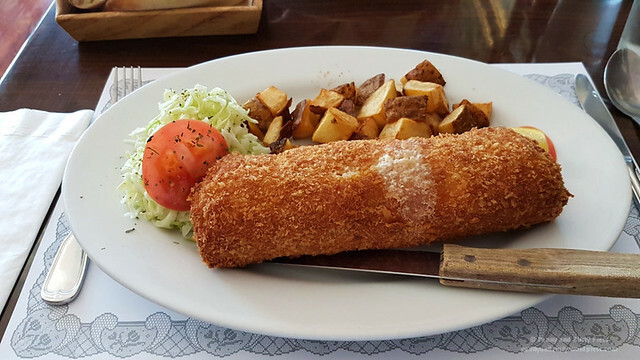 The rolled pork loin schnitzel is stuffed with kaymak cheese and is then breaded and fried and served with hash browns and coleslaw. The schnitzel is sometimes colloquially referred to as the maidens’ dream (девојачки сан/devojački san) owing to the phallic shape of the schnitzel. 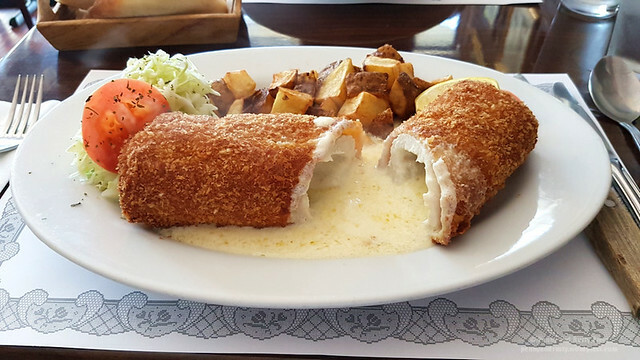 Cutting into this beautifully golden-hued log, the melted kaymak cheese quickly flowed out and provided a pleasant sauce to go along with the hash browns and the pork loin. The food here is definitely hearty and will stick to your gut and while the food takes a while to come out, the service was friendly. 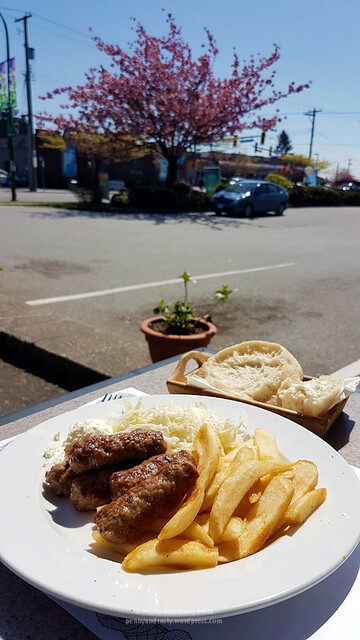 Posted on September 27, 2018, in Balkan, Eastern European, Restaurant Review, Serbian and tagged Balkan, Burnaby, Cabbage Rolls, Chevapi, Eastern European, Food, Karadjordjeva Schnitzel, restaurant review, Schnitzel, Serbian. Bookmark the permalink. Leave a comment.